This year we celebrate the 50th year of Singapore so in line with all the SG50 celebrations that have been happening around, let me share with you some of my favorite Singapore dishes one at a time. Today, I will talk about the glorious Nasi Lemak. My first encounter with Nasi Lemak dates all the way back in 2010. It was during our one-week-long honeymoon here in Singapore where I had my first taste of that fragrant coconut rice with ikan bilis (dilis), lots of garlic peanuts, egg and fried chicken. 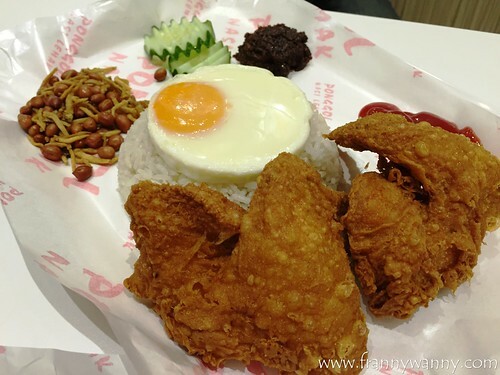 I fell madly in love with Nasi Lemak that I would order it every chance I get here in Singapore and when we continued with our trip to Kuala Lumpur. Fast forward to today, I've lost count of the number of Nasi Lemaks that I've already had. To me, it's one of my favorite comfort food where I can always be sure of it's consistent delicious flavor and the viands that come with it are pretty straight-forward, simple yet always satisfyingly good. So, for one of our food tripping weekends, Paul and I decided to check out the much talked about Ponggol Nasi Lemak in Jalan Besar. Thankfully, we didn't have to travel all the way to Punggol to be able to try it. Also, we're so happy to have O joining us for this trip as he knows Jalan Besar pretty well. 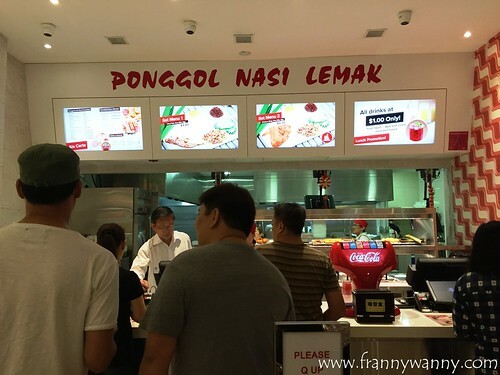 By the way, did you know that Ponggol Nasi Lemak actually do not have a branch in Punggol? 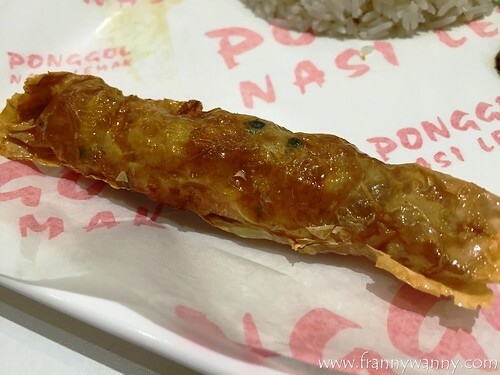 The original branch originated from, then called, Ponggol but has moved to Tanjong Katong, Upper Serangoon Road and recently opened their 3rd branch in Jalan Besar. The menu is simple, you can either choose from the set meals or go a la carte and create your own Nasi Lemak set. We skipped all the trouble and decided to go with our Set Menu 2 (S$4.30) which comes with Nasi Lemak rice, one piece Chicken Wing, ikan bilis, perfectly round sunny-side-up egg and sambal. If you have a bigger appetite or you simply just love Chicken Wings then go for Set Menu 3 (S$5) which comes with 2 wings, rice and ikan bilis. We want the egg so we opted to just go with one chicken wing. The rice was really fragrant and has a good fluffy texture. The egg was so yummy! I just love perfectly cooked round eggs with yolk that's in between runny and firm. The chicken was tender and was still delicious even after I removed all the skin (I'll tell you why later!). Lastly, the way I enjoy this is to carefully mixed all the peanuts and ikan bilis into my rice, mixed the egg and add a teeny tiny drop of sambal. It's like a fragrant coconut-flavored fried rice that's soooo yummy! This is definitely one of the best Nasi Lemaks I've had so far. Now comes the fun part, there's a myriad of side dishes that you can actually order on top of your Nasi Lemak set. From luncheon meat, fish cakes, more eggs, rice or veggies. Paul and I went for the Signature Ngoh Hiang (S$1.50) which was really yummy! It would be great if they have made it more filling but taste-wise, it was pretty good. Reading up about Ponggol Nasi Lemak, I've been getting raves about the Sauteed Crispy Chicken Skin with Curry Leaves (S$1.50/S$4.70). Okay, here's one big fact about me -- I do not like chicken skin very much. Surprised? A lot of my friends and colleagues would gasp upon hearing me say this while shaking their heads in disbelief. Well, despite that, I ordered this for Paul and O to try. 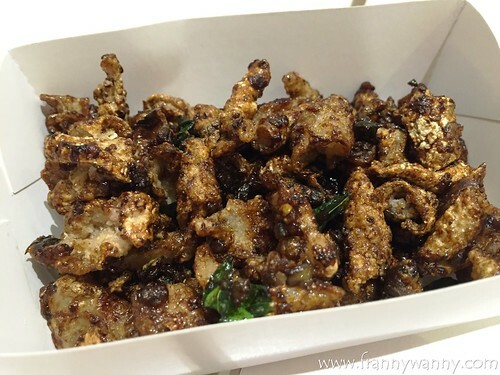 According to Paul, it tasted quite good as it reminds him of the Filipino Chicharon Bulaklak. Sure, I had a piece but I think I'll leave Paul to give the better and safer feedback. I guess for chicken skin lovers, this is definitely a must-try. According to him, it's interesting to note that it's purely skin. No fats as we found out that they really removed the fat and just deep-fried the skin keeping it very crunchy and crispy. It has a slight spicy kick alternating with the sweet notes from the kecap manis too. We had an amazing time at Ponggol Nasi Lemak. 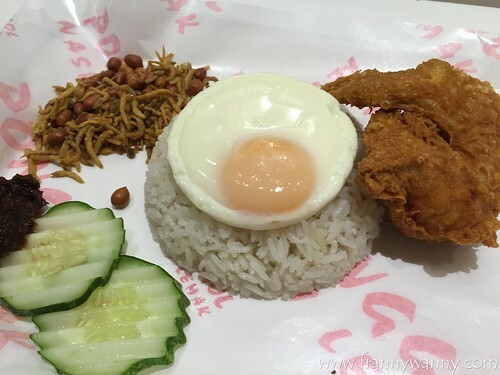 It's a simple restaurant that offers that one thing that they are genuinely good at -- Nasi Lemak. If you're a fan just like me, then I highly recommend for you all to give it a try. I can't wait to go back and perhaps try the other side dishes. Plus, they also offer homemade ice cream which I am so excited to check out too. Ponggol Nasi Lemak is located at 371 Jalan Besar, 01-01, Singapore. They're open daily (except Thursdays) from 12nn - 11pm. Call them at 6293-0020.